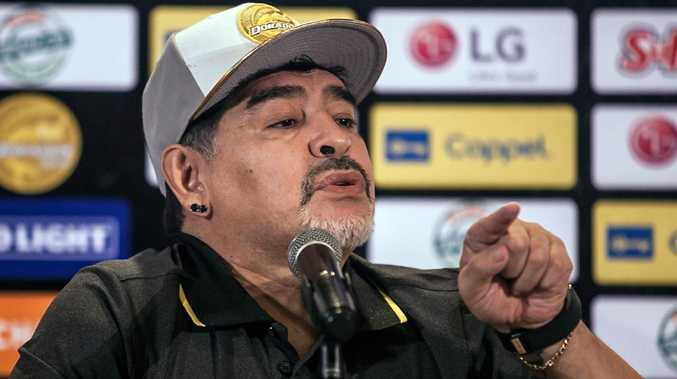 ARGENTINE football legend Diego Maradona described his decision to coach second division Mexican club Dorados as a rebirth after years battling addictions, as he officially became the team's new manager. 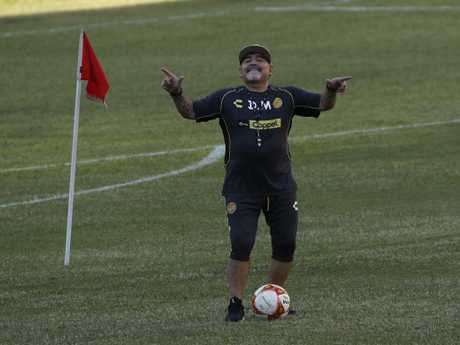 Maradona has raised eyebrows with the decision to accept a job in the heart of Mexican drug cartel country - the rough-and-tumble state of Sinaloa. But in his first press conference for Dorados, he described the job as a healthy new beginning after a long "sickness," alluding to his very public struggles with drug addiction, alcoholism and obesity. "I want to give Dorados what I lost when I was sick," he told the 200 journalists who packed the hotel conference room in Culiacan, the state capital, where he was officially presented as Dorados's new coach. "I was sick for 14 years. Now I want to see the sun, I want to go to bed at night. I never even used to go to bed. I didn't even know what a pillow was. That's why I accepted the offer from Dorados." Mexico was the scene of Maradona's greatest triumph as a player: leading Argentina to the 1986 World Cup title. "The Sinaloa Cartel will love Maradona. They are patriots. They really love their home state and this will raise the profile of Sinaloa," said Mexico security specialist Alejandro Hope, who sees drugs and sports intersecting as much as drugs and music. Maradona, 57, is a big fish for a little-known team founded just 15 years ago. He will reportedly earn $150,000 a month to coach a team where players complain of missed paychecks. Tom Marshall, who covers Mexican soccer for ESPN sports network, said the question floating among fans is whether the Maradona hire is part of a long-term plan to raise the prospects of the Dorados or an "ego trip" for the owners, the Tijuana branch of the politically connected Hank family which also owns casinos and horse racetracks? Few expect Maradona to succeed in the post. Many anticipate an inevitable clash of personalities. "Is this kind of a joke?" Marshall wondered. "Is this making Mexican football look a bit ridiculous?" Maradona, however, insisted his focus is on one thing: football. "People can say a lot of things, but … I was heading downhill, I was eating myself up, it was a step backward, and football is a step forward. All that changed thanks to my daughters," he said. Maradona grinned as he accepted a Dorados jersey with his old number 10 on it, and joked with journalists that he was ready to "sing any song you want me to." He also said he had turned down offers from the leftist presidents of Bolivia and Venezuela, his pals Evo Morales and Nicolas Maduro, to coach their national teams.